Leslie B. Otten started his ski area management career at Killington in the 1970s. Upon Sherburne Corp.'s buyout of Sunday River, Otten was dispatched to Maine. In 1973, he became the General Manager of Sunday River. In 1980, with money loaned from Sherburne Corp., Otten purchased Sunday River. Throughout the 1980s and 1990s, Otten oversaw a massive expansion of Sunday River, including the addition of new triple, quad, and detachable quad chairlifts, as well as multiple new mountain peaks. As the mid-90s approached, the Sunday River model was to be replicated. Thus, LBO Resort Enterprises Corp. was formed in 1994 with the intent of purchasing ski areas. 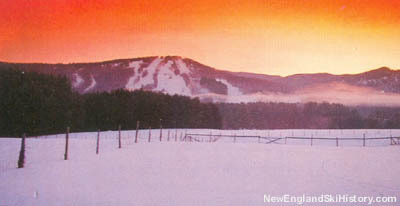 In July of 1994, Attitash was purchased by LBO. That fall, the first lift was built on the new Bear Peak complex, resulting in the renaming of the resort to Attitash Bear Peak. In October of 1994, Sugarbush was purchased by LBO. In June of 1995, Cranmore was purchased by LBO. Subsequently, LBO announced plans to market its New Hampshire holdings as one ski area - Attitash Bear Peak Cranmore Resort. On February 13, 1996, the Board of Directors of S-K-I Ltd. recommended a $104.6 million (plus $58.5 million of debt assumption) merger offer from LBO Resort Enterprises Corp. The shareholders of S-K-I Ltd. approved the offer on June 10, 1996. The following day, the United States Justice Department ordered the new company to sell Cranmore and Waterville Valley due to anti-trust concerns. On June 28, 1996, the deal between LBO Resort Enterprises Corp. and S-K-I Ltd. formally closed, resulting in the formation of American Skiing Company. Leslie B. Otten of LBO became President and Chief Executive Officer of the new company. Pursuant to the Justice Department order, American Skiing Company sold Cranmore to Booth Creek Ski Holdings, Inc. on November 27, 1996.